Meetings must serve a purpose. Speaker should know his subject. Encourage participation by asking questions. SAFETY DOESN'T COST ANYTHING, UNTIL YOU FORGET IT! The following are suggested toolbox safety meetings. The subject selected should address the appropriate stage of work. 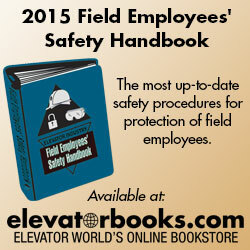 Elevator World provides 69 complete Safety Meetings in notepad form, taken from the 2015 Elevator Industry Field Employees’ Safety Handbook. Additional suggested toolbox safety meetings are available from numerous sources, i.e., insurance carriers, various trade associations, etc. If assistance is required in obtaining additional sources for toolbox safety meetings, contact your elevator company superintendent/manager.